This left facing, full length profile portrait is painted in watercolour on paper and shows a female figure in a standing pose. 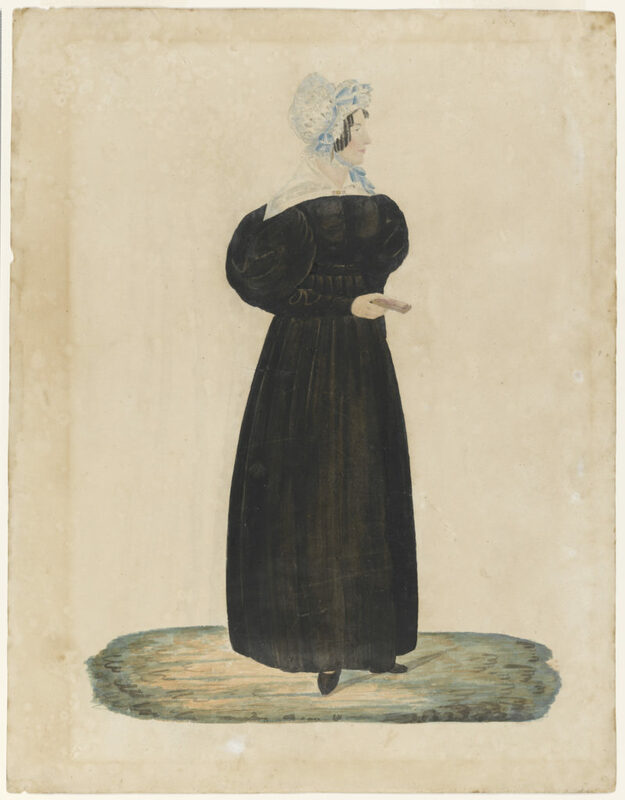 She holds a small book in her right hand, and wears a black gown with a gathered bodice and a round waistline, sitting slightly higher than the natural waist, with a large white-work embroidered collar, or pelerine, emphasising the wide shoulder-line which extends over the large balloon-shaped sleeves of the early 1830s, full to the elbow and tight-fitting along the forearm, above a tubular skirt reaching just to the instep to reveal black, pointed-toe slippers. The lack of fullness in the skirt suggests an early 1830s date, before the silhouette widened at the hem to balance out the shoulder line. The woman also wears a frilled and beribboned indoor cap, over her brown hair which is arranged in a face-framing row of narrow, tightly-curled, sausage-shaped ringlets. Nothing is known of the subject of this naïvely-drawn profile portrait, beyond the identity (suggested by descendants) of Elizabeth Sophie (1793-1885), wife of Mr George Prince (1795-1853), eldest son of the late Mr George Prince of Canterbury, Kent, England. It is one of a pair. Black painted ‘profile’ portraits or ‘silhouettes’ were known by various names during the 18th and early 19th centuries; ‘shades’ or ‘shadow portraits’ were the most common terms during the 18th century, with the term ‘profile’ becoming more common by the early 19th century and ‘silhouette’ only in common use in the 1830s. By the late 1820s interest in full length profile portraits, the work of artists known as profilists, rivalled earlier bust-length versions. This profile form of portrait, sometimes embellished with watercolour details, persisted through the 1840s when the silhouette’s position, as a cheaply available form of rapid portraiture, was threatened by the invention and introduction of photography.